Small firms and non-exporters across Ireland are beginning to show signs of economic recovery and growth. This is according to the InterTradeIreland Business Monitor for Quarter 3 of 2014. 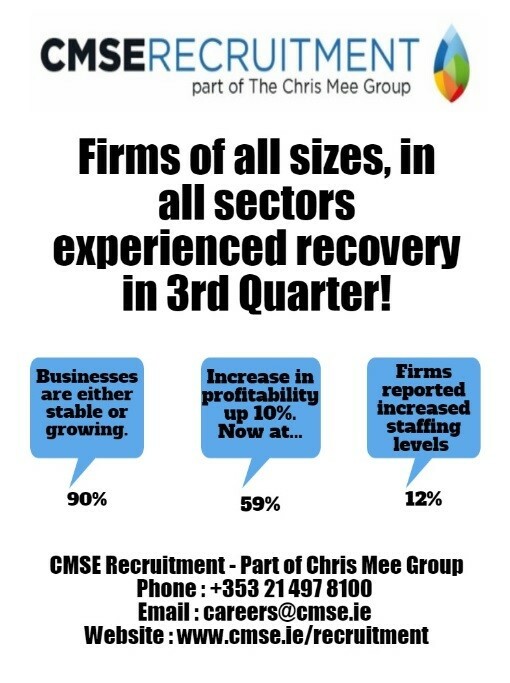 The report, showed that firms of all sizes, across all sectors experienced recovery between July and September 2014. This is the most positive set of results for the Irish Economy since 2008. It shows that almost 90% of businesses are either stable or growing. This is the highest percentage of firms reporting to be in growth mode since the recession began. It is almost double the number of firms in growth mode compared to this time last year. This steady recovery is also transferring into employment. 12% of firms reported increased staffing levels in the 3rd quarter, up from 11% in quarter 2. Firms across Ireland are also reporting an increase in profitability of 10% in the quarter – from 49% in Q2 to 59% in Q3. InterTradeIreland’s quarterly Business Monitor survey is the largest and most comprehensive business survey on the island. It is seen to be the ‘voice of local businesses as it uses interviews from across a vast range of sectors to track economic indicators from the whole island. It is based on the views of more than 750 business managers across Ireland and Northern Ireland.